37 racks / 148 covers per hour. 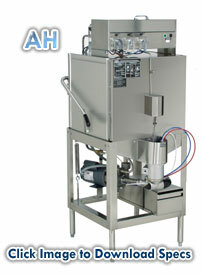 All heavy duty 304 stainless steel construction assures long life and years of trouble free operation. Specially designed pull-pins allow wash arms to be easily removed for cleaning. Size: 1 Each/Each SKU: W00023 Tags: CMA-AH-2	SINGLE	RACK	STRAIGHT	.